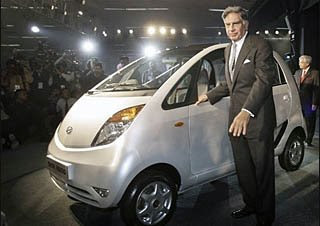 At its launch on March 23 in Mumbai, Tata Motors Chair Ratan Tata announced that when you preorder a $2,500 Nano, a needy family in India would get a matching Nano. Details are sketchy right now. Apparently this was something that Mr. Tata said at a press event and it was picked up by the Associated Press. But there were no PR materials available regarding the buy one, give one scheme and Tata’s PR staff was flummoxed when asked for details. At a later event when Tata, who looks a little like Harrison Ford, was asked to comment, said only that the marketing scheme was in formulation and details would emerge in April. Needless to say this is the most intriguing buy one, give one offer since the buy a house, give a house campaign I posted about in February 2008. But in that case the house you bought was in Sacramento, California and the house you gave was in rural Burkina Faso in sub-Saharan Africa. When I learn more I'll pass it on. You might want to check out Buy1GIVE1 (B1G1) at www.b1g1.com. Lots of examples there PLUS, on the new B1G1 Global Village (www.b1g1village.com) when you check the Residential Area you'll see another variation on the buy1Give1 Housing idea at the Habitat Residence. Also several builders/developers now doing Buy a Home, Build a Home through B1G1.